For the Fall-Winter 2015/16 Collection, Peter Dundas explores a glistening starry night, celebrating the symbols of astrology and the unforseen powers they behold. The dandyism of Jimmy Page and the glam-goth style of Stevie Nicks electrify the looks and set the vibe. 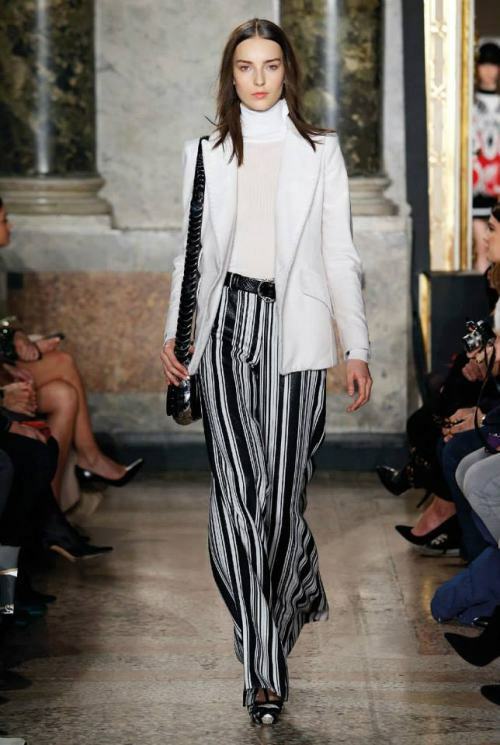 Graphic black and white undulates at the center of this collection, marking it with a modern urbanity, while also rendering homage to Emilio Pucci’s own black and white collection of the late 1950s. 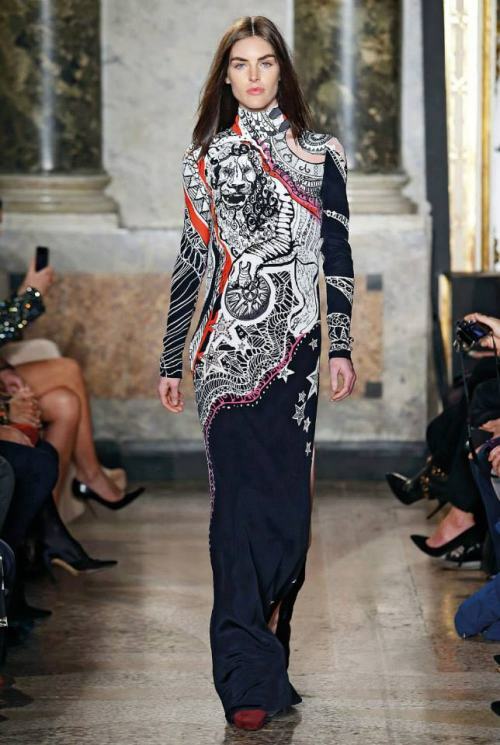 Zodiac iconography pulses through the collection, creating intriguing, cosmic-laden patterns. Shooting stars, blazing suns and lustrous moons illuminate fade-to-black prints, while hand painted zodiac signs orbit around silk crepe iconic T-shirt dresses. 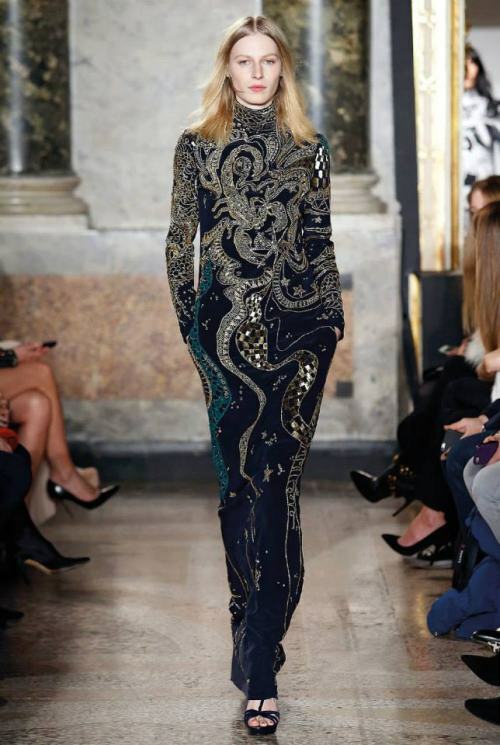 The symbols such as Sagittarius, Pisces, Scorpio, Libra and Aries are intricately reproduced in shimmering gold bead and thread embroideries on crushed velvet shorts, mini dresses or a dramatic sweeping cape. 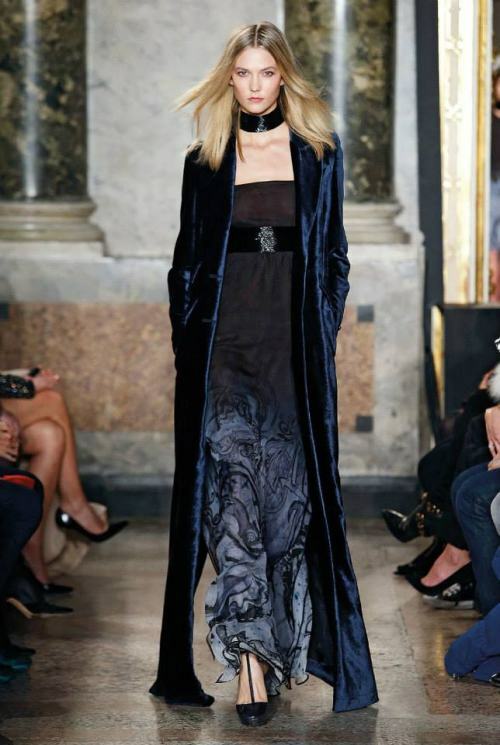 Maxi lengths unfurl on sweeping velvet coats, fine-knit sweater dresses or suede skirts punctuated with zodiac appliques. 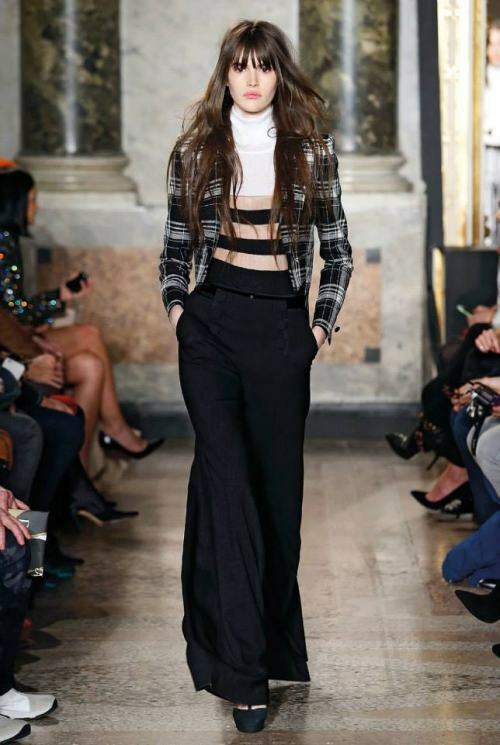 The new trouser silhouette, with an exaggerated wide leg, creates a bold look in black and white tartan or vertical stripes, while snug roll-neck sweaters feature three sporty stripes. Mini lengths, on second-skin dresses, skirts and shorts, create flashes of bare skin and a shot of unapologetic sexiness. The mystery of the night skies informs the collection’s dark palette of midnight blues, bottle green and black, but also radiates with flashes of cobalt blue, blood red and wasabi green. 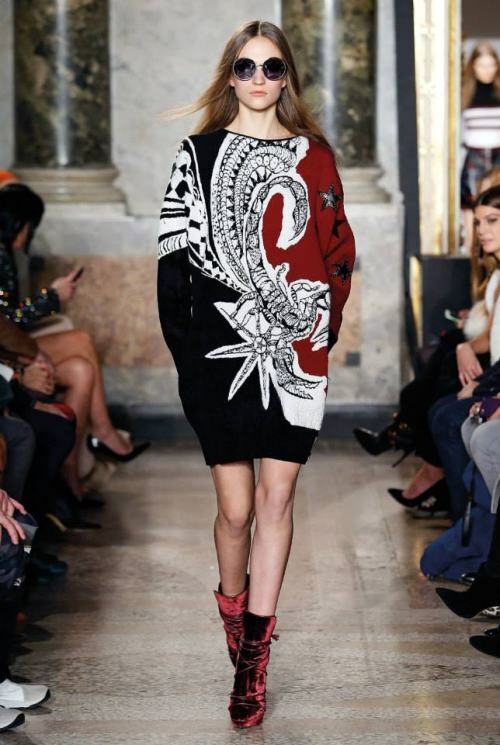 The graphic quality is enhanced by a ribbon patchwork of multi colored python and metallic deerskin on bomber jackets or on full length, banded knit dresses. A suede cape, punched with a leather and lacquered python applique and a shower of fringes. Fur chubbies mimic prints with their dripping intarsia patterns and marble effects. Tiers of satin charmeuse and silky transparent chiffon create Bohemian gypsy dresses for evening. A fringe dress swings with delicate bands of pearls. Micro-sequins are crushed together to create a blanket of shine on mini dresses, while paillette fringes animate the surface of a black and white checkerboard jacket. Embroidered thigh high boots matching with the dresses, platform ankle boots, Mary Janes and sandals with gold mirror heels elongate the silhouette. Structured bucket bags with maxi tassels and Janis bags with eyelets and maxi fringes complete the look. Star-shaped eyewear turns the gaze upward and onward to new magical journeys.